Anchor.fm is a free podcasting platform that makes creating a podcast super easy. That's the good news. In fact, I feed anchor has probably helped create a few meetings at podcast hosting companies to talk about their user interfaces. There is a dark side to Anchor, and that's what I'm here to talk about so you can make an informed decision. Before we go any further, I need to disclose I work for a competitor for Anchor and that's a shame. I've been in the podcasting space since 2005, and who I work for has nothing to do with this article. It has to do with the people I help move off their platform and are surprised to find out they gave away control of their show to Anchor. That is an average of 43 months. It's even less if we were to removed Mevio who went through 38.8 million dollars. Anchor was funded in 2015 and purchased by Spotify in 2019 (42 months) who had received 14 million. I always find it odd that I have to try to convince people that a company that does not charge for their service often goes out business. Other media hosts allow you to add three categories for Apple Podcasts. Anchor only provides one. So instead of being listed in Business, Technology, and Science, your show will just be listed in Business. That is not mentioned anywhere. Anchor has control of your show under their Apple ID, and some sort of ID for Stitcher. Someone who is brand new to podcasting may not understand RSS and how syndication works, and are not likely to know that Apple and Stitcher offer additional stats from your media host. So does this mean that Anchor is making it "easier" to syndicate your show (which they do), but they are preying on the uninformed? Keep in mind, that all it takes to list your show in Apple or Stitcher is the ability to fill out a short form (so it's not like Anchor is doing heavy lifting here). The email listed in your feed for iTunes Owner is not the YOUR email that you entered in your anchor account. The email in your feed is some randomly generated anchor.fm email. I tested mine and sent an email thinking they may forward any email coming to the anchor.fm account to my email listed in my Anchor account. It’s been 24 hours, and I feel it’s safe to say that I’m not going to get that email. This video shows this in more detail. The email listed in your feed is the email address Apple uses to contact you if they want to feature you, or if there is an issue with your feed. It appears I’ll never get those emails. Another example: I was playing with Radio Public’s new Podcast Website tool. I put in my Anchor RSS feed and it sent a link to the anchor email to verify the account. I never got the email and consequently couldn’t play with the tool. Again, Anchor is controlling my options. When I emailed their support they were able to update my email (four day turn around on the email) but why is it set that way in the first place? Again, a brand new podcaster won't know this, and won't be getting their email. If you upload an mp3, your file will come out as an m4a. That's fine, and I understand that. This doesn't seem like a big deal. However, if you leave your media host and try anchor for two months creating eight episodes. If you feel you've made a huge mistake, and you try to go back to your old media host (which has your old mp3 file still) they won't be able to pull in your information from your feed without issues. The files won't match up, and instead of just importing the episodes you did on Anchor, it will duplicate all of your past episodes. I've said it before, what I upload is what I want to download. I understand that if they insert ads they are going to change the file name and format.I'm talking I uploaded an mp3, and an m4a came down. Call me nit-picky, but I want the file I uploaded to be the one that downloads. In a recent story by Daniel J. Lewis, he mentioned how 57.7% of Anchor users had three or fewer episodes, and 41.7% had no published an episode in three months. As anchor has made it easier to start, and because it's free, many people jump on the Anchor bandwagon thinking this is the road to making money only to find making money quickly in podcasting is very hard. Consequently, these people quit podcasting. If this was a paid media host when you quit your files would be removed, and your feed would become invalid. This would lead Apple (and other apps) to remove the show from their directory. As Anchor is free, their podcast stays there potentially until someone at Anchor decides to remove it (if ever). This means that while Anchor may brag about having the most new podcast in Apple, they are also creating a substantial amount of "Podtrash" which are shows that quit and just stink up the place. If you embed an Anchor player on your website, if someone clicks the share button on the player it creates (for example) a tweet but the link is back to your Anchor website (not your website). So your driving more traffic back to Anchor – not to your website. If you want to leave their service, their tech support is good at adding the "301 redirect" to your show. This allows you to bring your audience with you (but if you had them submit your show to Apple and Stitcher you don't have access to the additional stats on that platform). When I sent an email about the email being wrong in my feed, it was resolved in four days from the original message. I Understand that I'm not paying anything for their service but their stats are basic. It shows you the number of downloads and if that is all you need that is fine. Just know that other companies show you what countries your audience is in, and what apps they are using. It is true Anchor provided a sponsor for my test show. This may have your thinking Anchor has a business model. 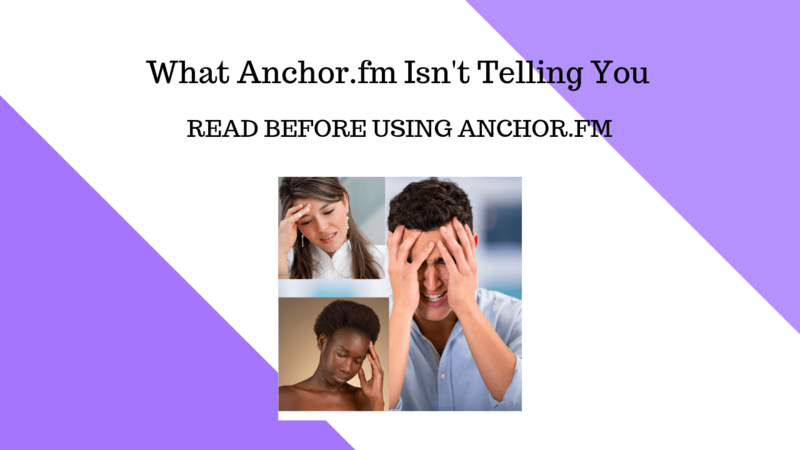 However, when I started my test shows on Anchor the only sponsor available was Anchor.fm. So what was supposed to be a way for the company to make money is another way for Anchor to lose money. Anchor is paying $10 for every 1000 downloads. That calculates to .01 per download. According to Libsyn.com one of the largest media hosting companies the median number for podcasts is around 170 downloads per episode. So you will make $1.70 per episode. While $1.70 is better than a poke in the eye (most things are), this is not enough to buy a 20 Oz bottle of mountain dew at my local gas station. You're going to need to build an audience for this to create any kind of serious income. When anchor launched their website stated they would submit your show to places like Overcast and Pocketcast apps. Both those apps pull from the backend of Apple Podcasts. This happens automatically and Anchor has nothing to do with it. This was an eye opening review.I have a show on Anchor which I was testing .Need to find better options before jumping in it seems. I am working up to starting a podcast and my host of choice was going to be Anchor.FM.. Its the usual.. if its too good to be true….beware.. I am going to look for another host….